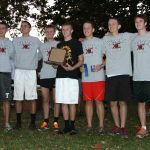 The boys cross country team qualified for the New Prairie Semi State for the seventh time in the last eight years. Sophomore, Josh Everetts was All-Regional in 14th place. Caleb Maddox was All-Regional, as well, placing 20th overall. 14. Josh Everetts 17:37 20. Caleb Maddox 17:49 28. Auston Davenport 18:09 36. Riley Carter 18:14 51.